Freshly prepared grave at cemetery. 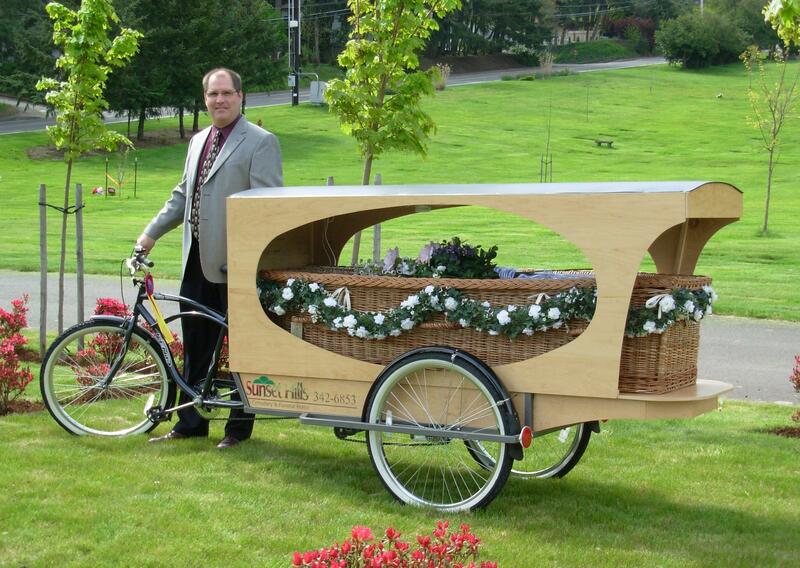 As part of its "natural burial" package, an Oregon funeral home carries coffins to the grave on a custom-built tricycle hearse. According to this KVAL story, it may be the only one of its kind in the world. The natural burial at Sunset Hills Funeral Home of Eugene, Ore., includes a basket-like bamboo coffin and a bike ride to the cemetery for $3,500. Owner Wade Lind came up with the idea of the tricycle hearse and sketched it out on a napkin after riding his bike to McDonald's. It took two weeks to design and build the bike, which Lind said is quite heavy when pulling a casket: "It takes a little bit to get used to because it doesn't handle like a regular bicycle," he said. "It's extremely long, and you have to really think about your turns. And of course, who you're carrying in the back." He electrified the bike last fall to make it easier to ride. He has delivered five bodies on it so far and now has a waiting list.